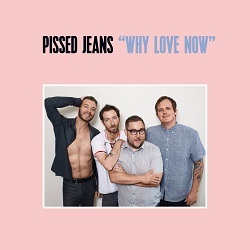 Listening to noise punks Pissed Jeans’ fifth full-length Why Love Now, you might wonder if everything is OK in their native Pennsylvania. The answer of course, is no. Industrial decay, the impending collapse of our ecosystems and the global economy understandably fill us all with dread – even more so in Trump’s America. Pissed Jeans have always played thuggish, noisy, disaffected punk rock – evoking The Jesus Lizard or Flipper – and frontman Matt Korvette has long explored topics like sexuality (‘Ignorecam’), masculinity and all its flaws (I’m A Man’) and the soul-crushing nature of modern work (‘Worldwide Marine Asset Financial Analyst’). It’s just now we’re all on the same page. End times. It’s what sets Why Love Now apart from the band’s previous efforts. This, their fourth LP for mega-indie Sub Pop saw them work with counter-cultural iconoclast Lydia Lunch as co-producer, and yet it’s their tightest, most-polished effort yet (things being relative). Why Love Now perfectly distils the existential dread of our post-truth world down to 12 slabs of visceral, bruising punk rock. Review by Cam Durnsford (PBS Music Coordinator). Oz Waves is a compilation of 80s DIY sounds out through Efficient Space Records. 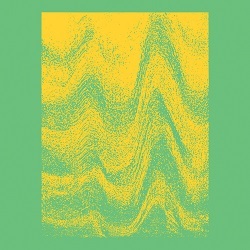 Known for his ongoing mix series Odd Waves, DJ, graphic designer and art director from Sydney, currently based in Amsterdam, Steele Bonus, has compiled this third collection for the label. As punk rock cleared the decks - chiselling off a couple of decades of barnacle build up on the hull of popular music - a new grassroots music model emerged. Tiny labels sprung up and artists self released records and cassettes in comparatively small runs. Being able to publish new work without the financial constraints of the music industry created a fertile landscape for new ideas to be disseminated into the world - the rise of synthesizers, drum machines and affordable recording gear worked to compound this effect - music was re-democratising in little pockets around the globe. There's plenty of meditative and exploratory stuff to get lost in here (see 'Larynx' by The Horse He's Sick) as well as the occasional pop flourish ('Take a Walk in the Sun'). Prod's 'Knife on Top' pairs an industrial grind with a menacing vocal sample to create a pulsing dancefloor freakout. Zerox Dreamflesh's 'Squids Can Fly' could be lifted from an On-U Sound compilation from the same time period, its a masterpiece of subtle production and a beautiful closer for the record. Efficient Space deliver another crucial disruption to the conventional history of Australian music.